WEIMAR WORLD SERVICE: Starlog: Quo Vadis? Well, it surely is telling that you had no comments on this article, fairly sad too. 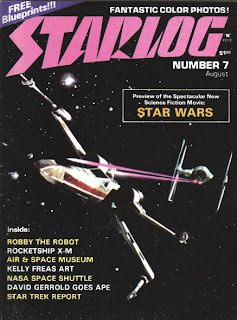 I bought my very first Starlog in 1976 and was a loyal subscriber for most of the 80's. Parenthood and other financial duties pre-empted that practice, and I lost track of the mag except for an occasional purchase for major summer blockbusters. I came across your blog when I noticed that editor Dave McDonnell wasn't appearing at Denver's yearly Starfest convention this spring and ran a search on him and Starlog. The fact he won't be attending after having done so for years rang a nostalgic and melancholy note for me. 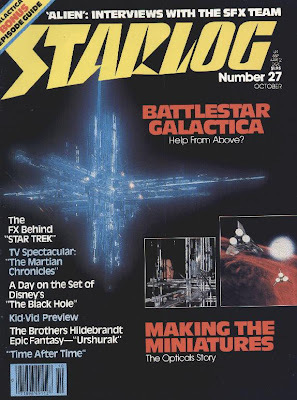 I suppose most younger fans may not have even heard of Starlog and it gets me right >there< that it may fade into history without recognition or remembrance of how it informed and pumped all of us geeks when web media had yet to exist. A sense of loss I can equate to the palpable, tragic gut-punch of the recent publishing of the last issue of the 150 year old Rocky Mountain News here in Denver. I truly hope someone at Starlog was reading your article and implements some of these internet changes. By now you probably know that Starlog has put an end temporarily to its print presence: http://weimarworld.blogspot.com/2009/04/last-print-starlog.html . I am pleased to say that they have been ramping up their starlog.com web site pretty rapidly, and I like what I'm seeing. They seem to know what they're doing online. And since the same company is planning to relaunch one of its old discontinued horror magazines, Gorezone, it may well be that Starlog will have a future in print again. I certainly hope so.